There is plenty of delicious gluten-free food in Rome. Taste them and visit the city's most interesting sites with our local tour guide. Roman Traditional Cuisine features many delicious gluten-free dishes. This is a wonderful journey through art and taste in one of Rome's most beautiful and historic areas. Do not forget to bring a camera and a good appetite! ATTENTION COELIAC SUFFERERS - THIS TOUR'S FOR YOU! Presenting a gluten-free food tour of the ancient city of Rome! Finally, there’s a food tour for people who suffer from Coeliac Disease and eat a gluten-free diet. Italy welcomes those who can’t eat wheat, barley, rye, and often oats. With a host of wonderful delis and restaurants that take Coeliac very seriously, you will not only manage, you’ll have your fill of some of the tastiest food in Rome, served per celiaci. In Italy, to eat food with friends and family is to celebrate life. Come and enjoy traditional recipes so beautifully adapted for the gluten-free diner, you won’t even miss the wheat. Certified gluten-free foods will keep you safe and satisfied as we explore the historic city center. We’ll provide you with an expert English-speaking guide. Our itinerary includes a walking tour of the Campo Marzio, Rome’s oldest district. 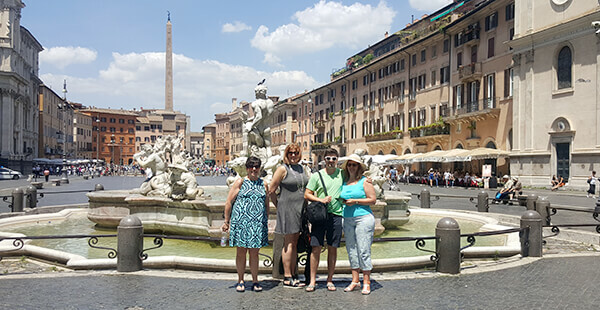 From the Piazza Argentina, we’ll walk through the Campo de’ Fiori and the Piazza Navona. As we marvel at the architecture and splendor of the city, we’ll visit some of the most Coeliac-friendly establishments in the area. We may sample regional dishes of pasta, fish or salty-sweet proscuitto. Some tasty fried appetizers called crochettes will whet your appetite. And, wait ‘til you see the desserts! Gluten-free never tasted so good! Extensive gluten-free menus will enable you to partake of all Italian treats. It is a challenge to travel safely as a sufferer of Coeliac Disease, or with a child who requires a gluten-free diet. Worry no more! 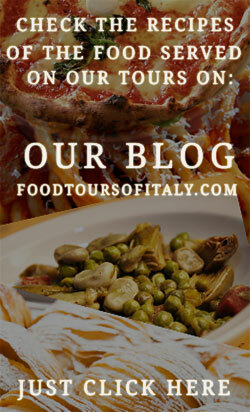 Book your exciting Gluten-Free Food Tour of Rome today! This is fast becoming a popular tour, so book well in advance. Please contact us at info@brunotours.com.